This is M'Kett from my men vs orcs universe. As this is just a cave test while I work on adapting and polishing The Cold Wrestling War, I haven't decided what's going on in this one. I'll leave it for you guys to imagine! 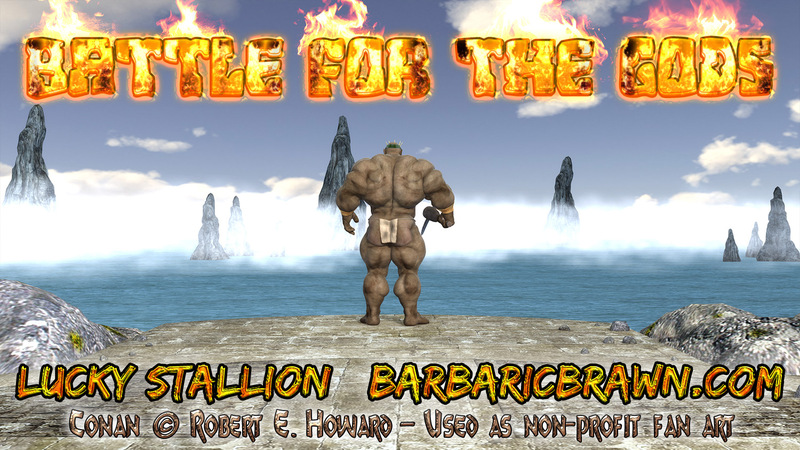 Battle for the Gods is the full story version of my short story Conan vs Ogre King from a couple of months ago. This is my second full Conan the Barbarian piece, the first being his fight against my pint-sized orc named Little Zug. Conan, ready for a few nights of pleasure in Shadizar, finds himself lost in a dark, mysterious cave. On the other side, he meets Thul'rog, the Ogre King, and must prepare himself quickly for the greatest fight of his life. The hulking ogre, whose low intellect caused him to misunderstand Conan, lunges at the barbarian, ready to battle the little human and teach him the many reasons he is the king of the ogres! Only one male can win in this battle upon a strange and ominous stone arena, and the one who wins will find that his reward is the fulfillment of his greatest desires... in more ways than one. Here's Battle for the Gods! Having finished with the environment, I'm currently at work on the story part of Battle for the Gods (the Conan vs Thul'rog story). I'm also working on a couple of other projects in conjunction with it, one being my next PDF adaptation. For that, I've chosen The Cold Wrestling War. I'm rebuilding the lighting of nearly all of the panels and updating the surfaces of some of the objects like the wrestling ring. I'm planning on adding bonus panels, as always. I'll have more info for you guys when these projects are far enough along!